We have initiated a work order to install the W16-1(3) sign at each end of this section of MD 896. We determined that a warning sign to alert motorists that bikes may be in the lane would be of greater use. The florescent yellow of the warning sign provides that little more punch through the shade that grabs the motorists attention. We expect the signs to be installed within the next 45 to 60 days, weather permitting. This is a warning sign with black letters on a yellow background alerting motorists that bicycles may be present in the travel lane. W16-1(3) The BICYCLES MAY USE FULL LANE sign should be installed at locations where lane widths and/or other conditions create an extraordinary hazard for bicyclists sharing a lane with motorized vehicles on roadways where no specific bicycle facility such as bicycle lanes, shared lanes, or adjacent shoulders exist. This sign, as shown in Figure 3.6, shall be used only where "substandard width" lanes could make it particularly unsafe for a bicyclist to travel along the right curb or edge of the roadway. 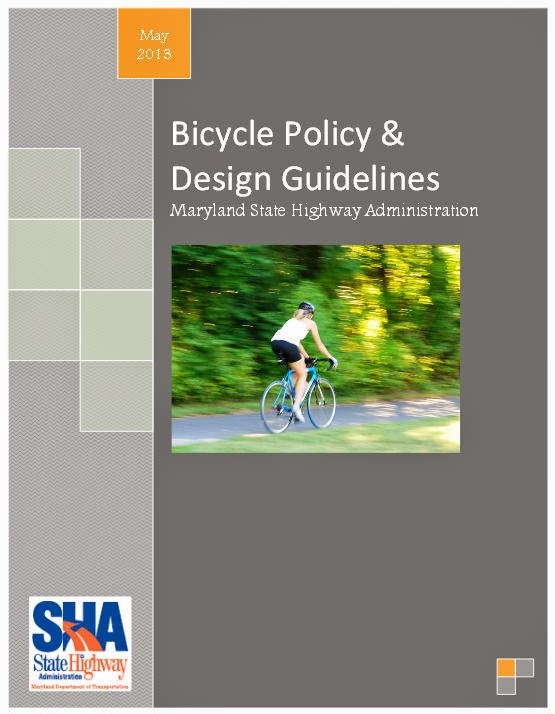 What we have learned from this effort is that Maryland's State Highway Administration is less hard-line than DelDOT when it comes to custom bicycle signs. The above is not found in the National MUTCD. The closest was a similar sign used by the City of San Francisco, CA. We think it is safe to say that, had this stretch of Route 896 been in Delaware, the best we could have hoped for would be the standard W11-1 Bicycle Warning Sign with no plaque of any kind. 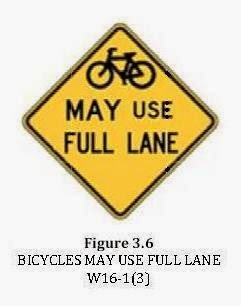 Unfortunately, most traffic engineers would agree that this sign by itself has little impact on motorist's behavior toward bicyclists in the roadway. In fact, its original intent was to warn drivers of bicyclists entering the roadway ahead, not riding on the roadway itself. 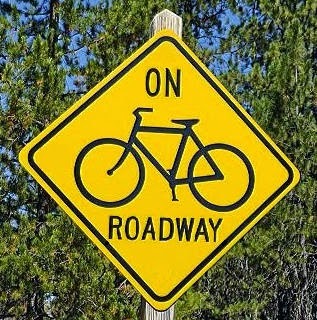 A more creative, and accurate use of the W11-1 sign would entail using the words "On Roadway" as depicted on the right. 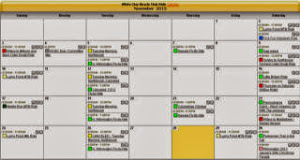 Don't expect this anytime soon, though. 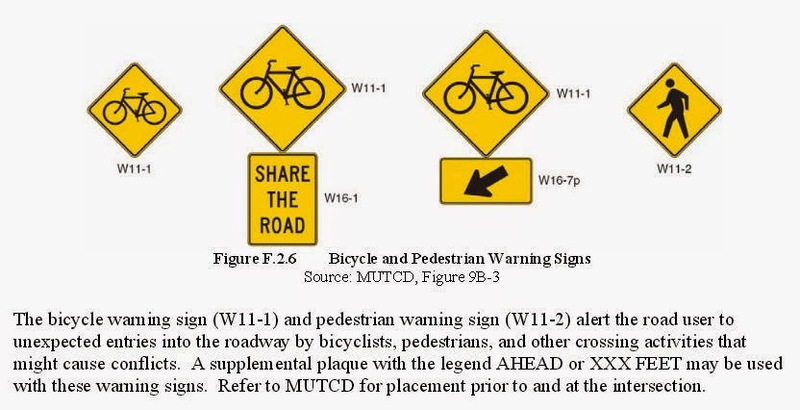 The section in Delaware's MUTCD that specifies the bicycle warning sign is above. 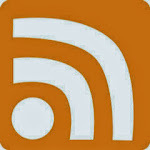 You can also access the manual on-line, and scroll down to page F.2.3. DelDOT's revised use of the sign - as campaigned for by Bike Delaware - does not currently match its intended use.